I was looking for the perfect mini food for the big game, and had these two recipes on my list of things to try. Both were amazing, and with a few tweaks, can be made even tastier the next time around. For the tofu tacos, I subbed arugula for the cabbage, any greens would probably work if cabbage isn’t your thing. For the shrimp tacos, I subbed tequila for rum, because that’s what I had at the house and didn’t feel like buying rum just for this. 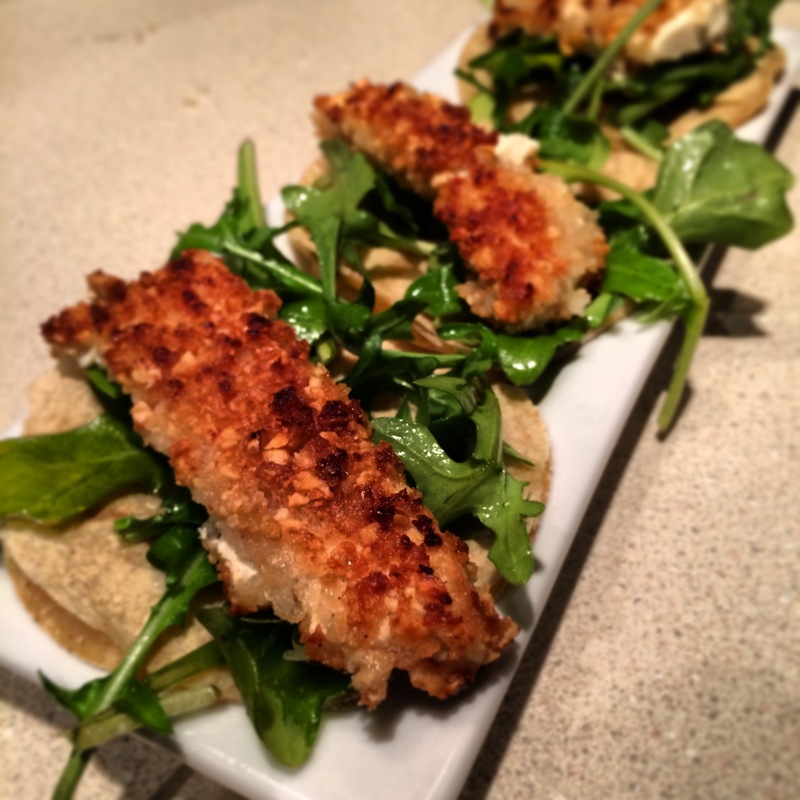 Peanut-crusted Tofu Taco (Original recipe found here). Cut tofu lengthwise into 4 (1/2-inch-thick) slices. Place tofu slices on several layers of heavy-duty paper towels. Cover tofu with additional paper towels; let stand 5 minutes. Cut each tofu slice, lengthwise, into 1/2-inch-thick strips; cut strips in half crosswise. Place peanuts in a food processor; process until ground. Combine peanuts and panko in a shallow dish, stirring well. Combine milk and egg in a shallow dish, stirring well. Place flour in a shallow dish. Heat a large skillet over medium-high heat. Add 1 tablespoon oil to pan; swirl to coat. Dredge half of tofu in flour; dip in egg mixture. Dredge in peanut mixture. Add coated tofu to pan, and sauté 4 minutes or until golden and crisp, turning to brown on all sides. Remove tofu from pan, and drain on paper towels. Repeat procedure with 1 tablespoon canola oil, tofu, flour, egg mixture, and peanut mixture. Combine cabbage and the next 4 ingredients (through jalapeño). Drizzle the cabbage mixture with remaining 1 tablespoon oil; toss to coat. Heat tortillas according to package directions. Place 2 tortillas on each of 4 plates; top each tortilla with 1/4 cup slaw. Divide tofu evenly among tacos. Serve with lime wedges, if desired. Rum-glazed shrimp with boozy salsa (Original recipe found here). Next time, I want to try it with scallops – shrimp are a lot of freaking work to clean up! Finely chop the red onion, and bell pepper (I used orange bell peppers because they’re attractive), then combine everything except the cornstarch and shimp in a medium-sized bowl. Whisk together the ingredients, making sure the honey is fully dissolved in the marinade. Taste it before you add the shrimp! Make sure it’s delicious. Devein shrimp and remove shells up the tail. Add the shrimp to the marinade and let them rest for an hour in the refrigerator. Preheat your grill or pan to medium-high heat. Take the shrimp out of the refrigerator and skewer them (this isn’t strictly necessary, but I find they’re easier to handle this way), reserving about a cup of the marinade. In a small bowl, add about a tablespoon of the marinade to the cornstarch, whisking briskly until no lumps remain. Brush the shrimp on both sides with the reserved marinade. Grill the shrimp for about a minute on each side, flipping them every 30 seconds and brushing the hot side with the reserved marinade after flipping, until they are bright pink and slightly charred. Remove the shrimp from the skewers. 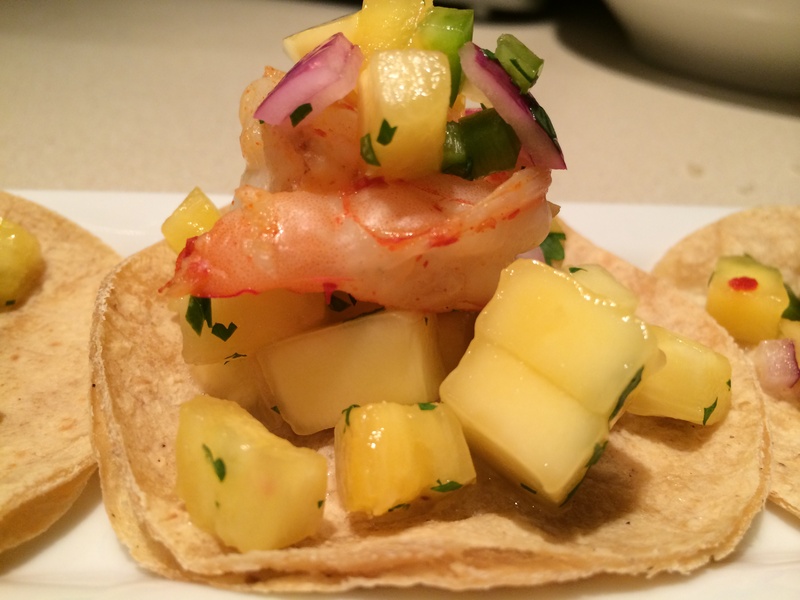 Place one shrimp on top of each mini-taco, then top with lettuce, avocado, and salsa. Fold them in half and use a toothpick to secure. Serve immediately. Add all of the ingredients to a large bowl and toss gently to combine. Taste and adjust seasonings (juices, cilantro, salt, jalapeno) as desired. Keeps in the fridge for a few days.